With the trumpet’s soaring first notes of “Serenata Huasteca” played by Mariachi Aguilas of Las Cruces, 71-year-old Beatrice Lucero, of Albuquerque, erupted from her seat and broke into a joyful foot-tapping and hand-clapping dance. Lucero, who grew up in the village of Mesilla, just north of Las Cruces, has loved mariachi music all her life, and she especially cherishes the memories it conjures of a more than 40-year marriage to her late husband, who wooed her by serenading from beneath her window. The exhilarating strains of mariachi music that now moved her to dance aroused bittersweet romantic memories of defying her family to marry the man she loved, though he had little more to offer than his loving devotion. As it is for Lucero, so mariachi is deeply embedded in the hearts of generations of New Mexicans, who have adopted and shaped its traditions according to their own lives here. It is la música de la gente (the music of the people), the common folk, with lyrics describing their many triumphs and sorrows involving matters of the heart, betrayal, politics, heroism, and mortality. It is the soundtrack of baptisms, graduations, weddings, reunions, and matanzas (harvest festivals). The ability of contemporary musicians like Mariachi Aguilas to inspire women of their grandmothers’ generation, like Lucero, to dance and swoon with nostalgic emotions, testifies to the persistent vitality of mariachi in New Mexico. Every year at this time, the beating-heart thrum of mariachi resonates through southern New Mexico at the Las Cruces International Mariachi Conference. On the second Saturday of November, music lovers can hear the soaring and aggressive trumpets, the melodic violins, and the moist vocals that typify mariachi at the Spectacular Concert, which features some of the top mariachi bands from Mexico, New Mexico, and around the world. Can there be any question that this vibrant, traditional music culture is alive and well in 21st-century New Mexico? The essence of mariachi has only developed since the 19th century, when it began in Jalisco, Mexico, as a poor man’s solace and joy, served with a jolt of tequila. Throughout the 20th century, the Mariachi Vargas de Tecalitlan, of Mexico, was the repository and training ground for most of the influential musicians and arrangers. On the screen, mariachi enjoyed a surge in popularity during Mexico’s golden age of cinema from the 1930s to ’60s, and again in modern films like Robert Rodriguez’s El Mariachi, and Desperado, starring Antonio Banderas. Richie Valens’ 1960s hit “La Bamba” catapulted the music into the rock ’n’ roll era and in the late 1980s, Mexican-American pop singer Linda Rondstadt introduced cross-over audiences to mariachi with the release of her Canciónes de mi Padre album. As a result, mariachi music hit its zenith in the 1990s, with greater record sales, more concerts, and more radio stations devoted to its music. Perhaps surprisingly, mariachi was cool, still evolving, and spreading like wildfire, picking up influences from all different regions, its practicioners experimenting with different combinations of sounds and instruments. Meanwhile, over the course of the last half-century in New Mexico, Roberto Martinez’s Los Reyes de Albuquerque was developing a uniquely New Mexican sound that elevated sweetly lyrical violins over blaring trumpets, and introduced homegrown ballads that nudged aside Mexican standards. Today, a small-framed man of 82 years, with a warm smile and kind brown eyes that seem to envelop you in an abrazo (hug), Martinez says he never dreamed he’d become the don of New Mexico mariachi music. Born in 1929 in the farming and ranching village of Chacón, north of Taos, Martinez grew up among the majestic pines and picturesque scenery of the Sangre de Cristo Mountains, where he heard and learned from his family and neighbors the renditions of Mexican folk dances, like polkas; marchas; and the sacred alabado religious hymns of the Penitente Brotherhood (a lay confraternity that has provided religious and community services for centuries in New Mexico). Martinez would marvel when traveling troupes of musicians visited his village in carpa shows, singing and playing inside large canvas tents. The shows featured performers from all around the state, and from faraway places like Mexico and Texas. As a teenager, Martinez was exposed to the charro (cowboy) movie musicals of the 1940s and ’50s, with stars like Jorge Negrete and Pedro Infante singing rancheras (Mexican folk songs) and newly popular mariachi songs. Fiercely patriotic, Martinez as a slight young man had to persuade an Air Force recruiter to check the box saying he passed minimum weight requirements. Martinez later married Ramona, “a beautiful dark-haired woman with hazel eyes wearing a blue satin dress,” and discovered she was from a family of folk musicians. The couple moved to Denver, where Roberto began playing music in cantinas with his wife’s uncle. For the first time, Martinez donned a charro suit with silver buttons and a wide-brimmed sombrero, playing his favorite instrument, a vihuela (a hump-backed five-string treble rhythm guitar) for the ensemble. When Martinez left the Air Force, he moved his rapidly growing family (their brood eventually reached five children) to Albuquerque, where he got a day job at Kirtland Air Force Base. He formed Los Reyes de Albuquerque, playing nights at clubs, weddings, and other occasions. The band struggled in the early years, but soon began to churn out hits that weren’t just remakes of Mexican standards but newly composed corridos (ballads) that struck a deep chord with New Mexicans. One of his first and most heartfelt songs was “El Corrido de Daniel Fernandez,” a ballad about a real-life Los Lunas soldier who, in the late 1960s, gave up his life for his fellow soldiers in Vietnam by falling on a grenade tossed into the midst of his platoon. Fernandez posthumously received the Congressional Medal of Honor, and the song launched the group’s success. Soon after, Los Reyes released “El Corrido de Río Arriba,” telling the story of activist Reies López Tijerina and his 1967 takeover of the Tierra Amarilla courthouse to protest the loss of Spanish land grants and to promote land and civil rights for Hispanics in New Mexico. The takeover provoked a shootout, and national press coverage, after National Guard tanks rolled into the quiet northern New Mexico village to quell the uprising. It was songs such as these that prompted Professor LaMadrid to credit Martinez with providing New Mexico Hispanics with a sense of renewed pride and identity. 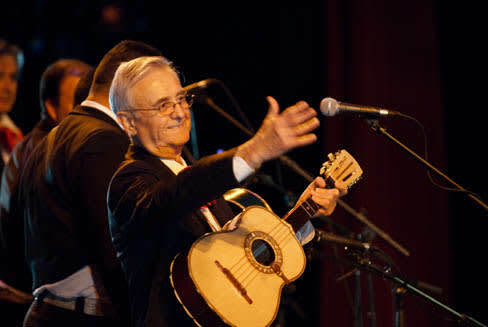 Today, Martinez is a grandfather—his many children and grandchildren call him “PaPo,” a respectful term of endearment—and Los Reyes performed its farewell tour in 2009. But Los Reyes still occasionally performs at venues both humble and grand, at community dances, concerts, fairs, and festivals. Martinez has passed his love of mariachi to several of his children. His daughter, the late Debbie “La Chicanita” Martinez, was a rising superstar in mariachi music in the 1970s and ’80s, but she died tragically of cancer at age 48 in 2007. A son, Lorenzo Martinez, has become a trend-setting and renowned musician, introducing the New Mexico regional style to national audiences. Taking up the violin at age nine, Lorenzo studied classical and folk traditions, and was taught by the renowned violinist Cleofes Ortiz, of Bernal. Lorenzo recorded three landmark CDs of violin Nuevo Mexicano. In 1970, along with sisters Roberta and Doris, Lorenzo formed Los Chamacos. In 1976, Lorenzo joined the Mariachi San Miguel, the group that accompanied legendary mariachi singers like Antonio Aguilar, his wife, Flor Silvestre, and their sons Pepe Aguilar and Antonio Aguilar Jr. He also performed with mariachi groups that accompanied other legends in the genre, like Yolanda del Río, Lucha Villa, Gerardo Reyes, Chelo, Aida Cuevas, Beatriz Adriana, and Little Joe Hernandez. Today, Lorenzo continues to play with a number of mariachi groups, both in the United States and Mexico; here in New Mexico, he teaches mariachi, passing on his family’s traditions and skills to the next generation of performers. As groups like Los Reyes shaped New Mexico’s regional style for decades, a slew of new bands is redefining the scene today. Juan de la Cruz and his band, Mariachi Aguilas, is making its presence known in southern New Mexico as the group holds on to mariachi traditions of the past, but continues to evolve its own style. De la Cruz, a stout man in his late 20s with a businesslike manner, played trumpet at Oñate High School, in Las Cruces, but had little interest in the genre until he took a class in mariachi. “The more and more I got into the class, the more and more I got into the music,” says De la Cruz. The band typically fields two trumpets, four violins, a guitarrón (which forms the heartbeat of the music), a classical guitar, and a vihuela. De la Cruz says that while the group emulates the styles and songs of the established mariachi artists, he also experiments with different instruments and arrangements to create a distinct sound for the band, which plays at Las Cruces–area restuarants. Juan Lucero, leader of Los Primos, a popular trio from Albuquerque, says New Mexico’s multicultural society provides the perfect environment for the evolution of mariachi. “We still definitely play a lot of the same traditional rancheras and boleros that most mariachi bands play,” Lucero says, but it also plays jazzy or pop renditions of contemporary Latin songs. And instead of the traditional charro outfits, his group dons colorful and festive guayabera shirts popular in Latin American and the Caribbean. New Mexico’s open-minded music scene has also nurtured female performers and groups, something frowned upon in more traditional realms. Elizabeth Ojeda, at age 14 one of the younger members of the popular New Mexico group, Mariachi Tenampa, grew up listening to mariachi music, just as Roberto Martinez did a couple of generations previously. The music has been passed on for several generations in her family. Aurelio Arley Sanchez, of Tomé, is a veteran of the Albuquerque Journal. His poems and short stories have appeared in several literary journals; read excerpts of both at www.arleywriter.com.